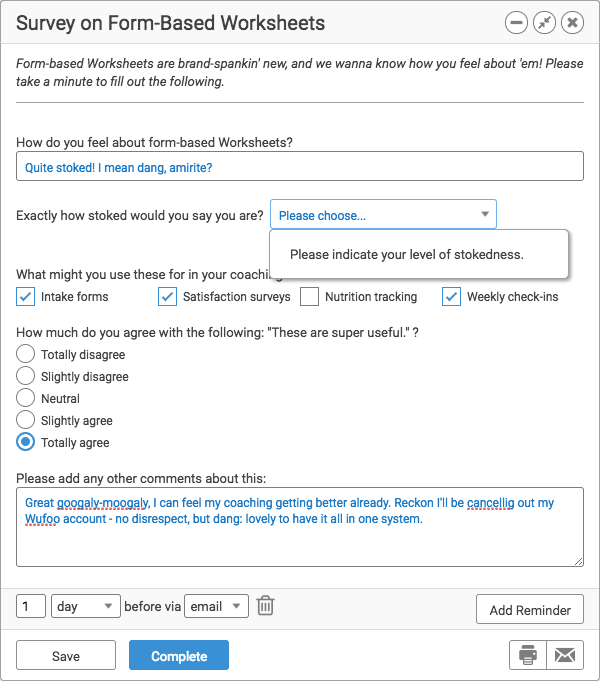 The basic style of Worksheets within CoachAccountable is as a Word doc that is freely editable, both by coach creating the worksheet, and client filling it out. 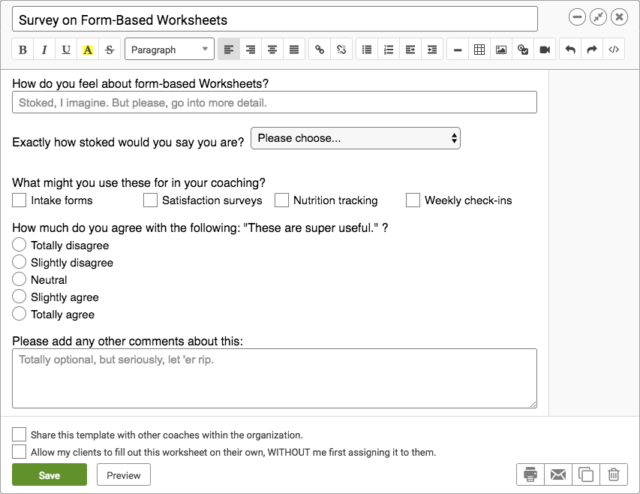 But with Form-Based Worksheets, coach can create Worksheets with the free style editability of a Word doc BUT with form elements interspersed, which in turn are specifically what a client is meant to fill out. 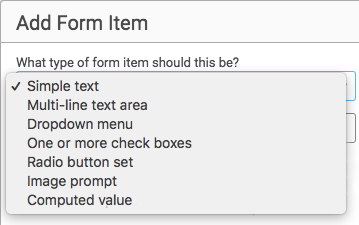 “Form elements” refers to check boxes, radio buttons, drop down menus, and text boxes. That little guy, fifth in from the right. This looks like a lot, but really, it’s quite manageable. Seriously though: take a moment to read the helper text for each of these fields and you’ll be adding form inputs like a pro in no time. Notice the validation option we picked: that this input must have something typed in. 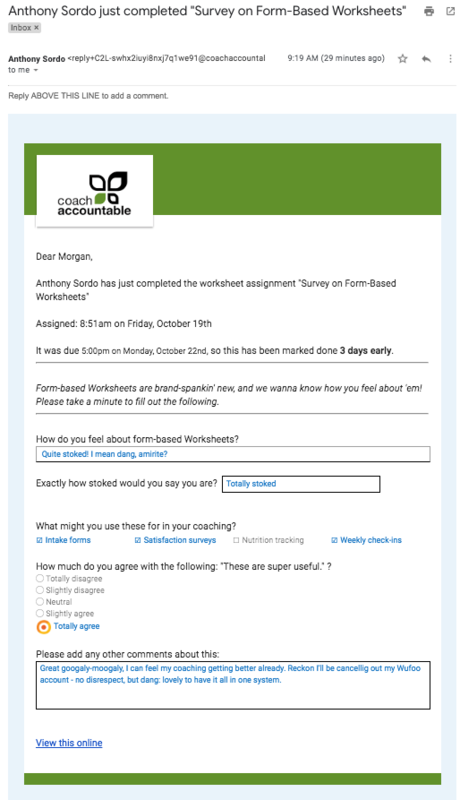 By doing this the user is prevented from marking this worksheet complete so long as this input is left blank, and presents them with the message “Please, we’d love to know how these make you feel.” if they try to. Whaddaya mean I’m “leading the user” with my placeholder text? Note the 40% width, which allows this item to sit on the same line as the question. Lookin’ good. 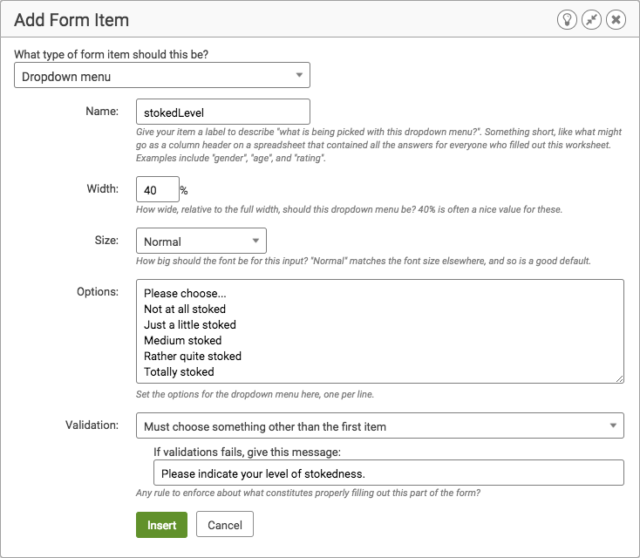 Again here we pick a validation rule, “Must choose something other than the first item.” We put a “Please choose….” option for the first item, which is what shows (and is selected) by default when the user first starts the worksheet. That validation rule means they have to pick some item from the dropdown menu other than that first one, and they’ll be asked to “Please indicate your level of stokedness.” if they try to submit without doing so. We pick 25% to let the 4 options all nicely fit on one row. Our placeholder text invites feedback in an enthusiastic but non-pushy way. 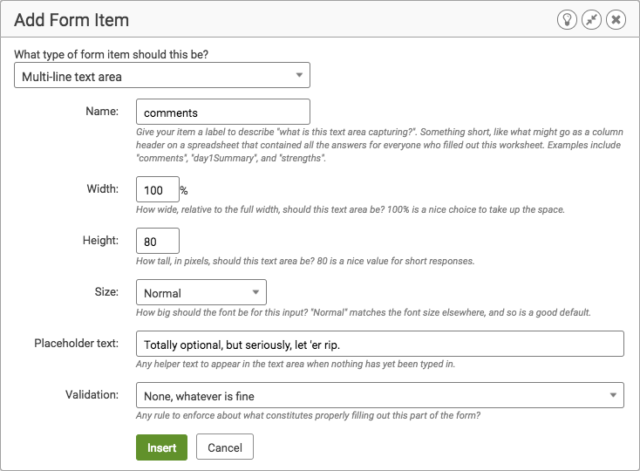 100% width means each item takes up a full line, making the options stack vertically. This’ll get us some unbiased feedback, right? Cool, good to go. Let’s add a little intro text, hit save, and then assign this to one of our clients! This works just like assigning a regular worksheet. 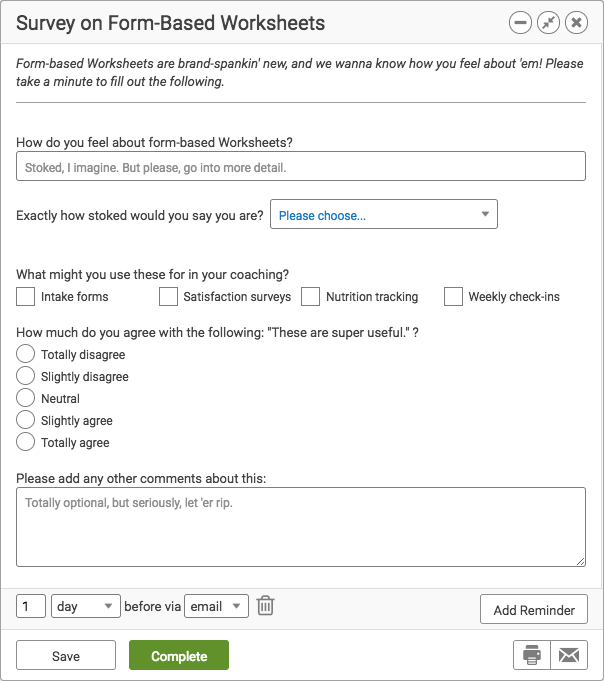 No form inputs in the worksheet template you’ve assigned? 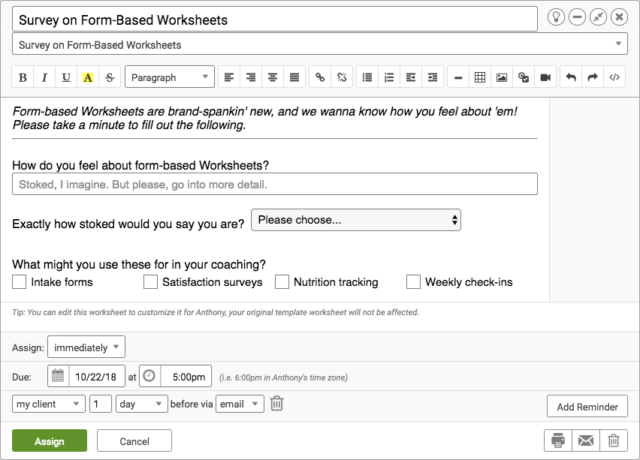 Then this is a freestyle worksheet like a Word or Google Drive doc for your client to fill out, and they’ll be given the WYSIWYG editor with full editability. One or more form inputs in the worksheet? 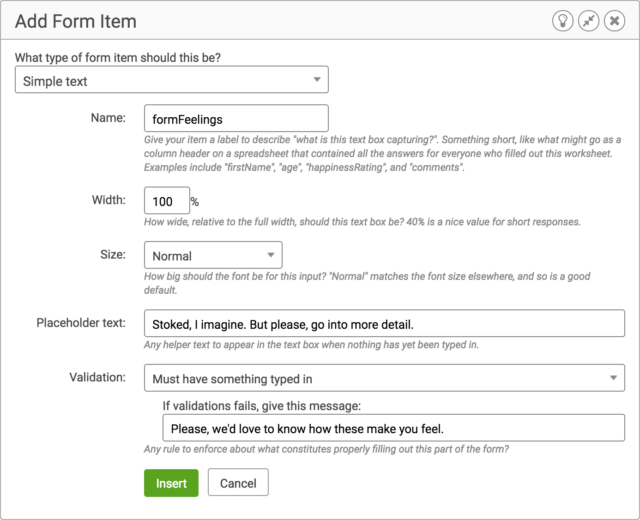 That kicks it into “form” mode, meaning your client WON’T have the WYSIWYG experience of filling it out, but rather be presented with the form inputs only to fill in. Buttons and inputs, just begging to be filled in by your clients. “Ah, right! I forgot to indicate precisely how stoked I am!” thought probably no one, ever. Fun fact: Gmail for whatever reason replaces the “chosen radio button” symbol with a big, orange target-looking icon. Sigh, at least it’s crystal clear which option your client picked. And that’s all there is to it. 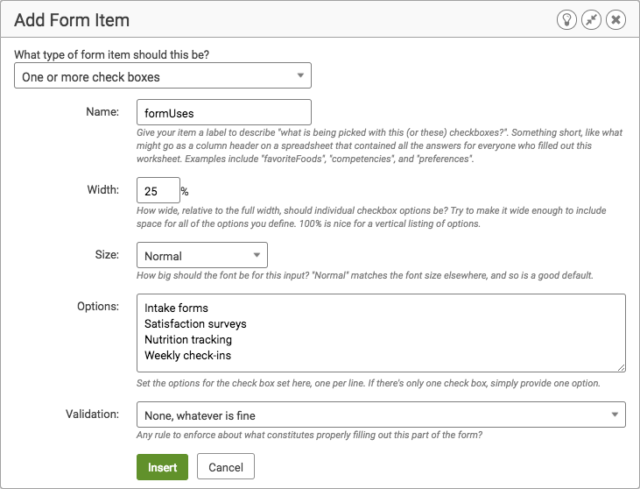 Adding one or more form inputs turns a worksheet into a form-based worksheet, which drastically alters your client’s experience of filling it out. 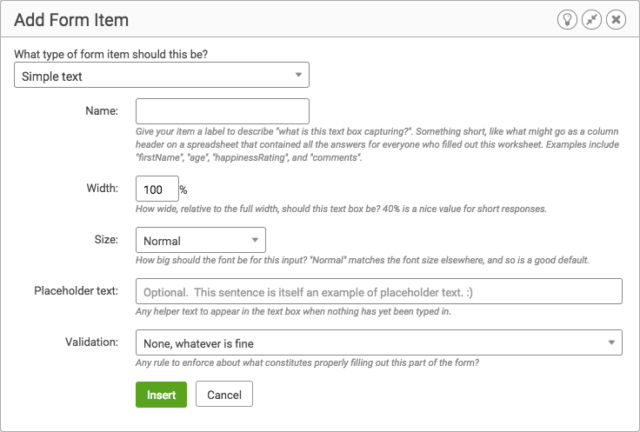 For each of your worksheet templates you have the choice of making it WYSIWYG style or form-based, whichever is more appropriate to the substance of that worksheet.